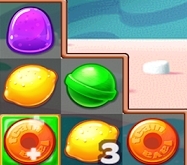 The level’s objective is to drop three orange cakes and three green cakes into the delivery boxes below. You’ve got 46 moves to do it. There are three types of obstacles here: The chocolates, the rats, and the cinnamon sticks. Cinnamon sticks lock up cookies, which are immobile until you make a match with them to break the locks. The chocolates are immobile and only go away if you make a match next to them. The rat moves with every move you make and eats whatever treats happen to be on the spaces he moves into. This can include the cakes you need for the delivery order! Now, my initial gut reaction here was to remove the chocolate. They’re blocking the tile spawning points at the top of the map, so when new cakes spawn, they’ll only spawn on the edges, which are very difficult to match. I did that and failed the level over and over, and I was wondering if I just needed to be lucky enough. That’s when it hit me. The chocolate wasn’t there to get in my way. It was there to help! If you make a match in the center of the map, the game can’t spawn new cookies to fall from above, so instead, cookies to the upper left or upper right slide in to fill the void. The cakes are in the upper left and upper right corners, but if you make a match near the center, then they’ll have to slide at least three spaces toward the center, making them much more easy to match! Of course, this strategy won’t last forever. Random tiles falling down mean that the chocolates are going to break eventually, but if you avoid breaking them for as long as you can, then you’ve got much better odds of funneling the cakes toward the center. This is the kind of puzzle design that I love to see. It’s asking players to think of something old in a brand new way. You can’t do this all the time or you risk tiring out your players, but a revelation like this makes players feel clever and really engages them. 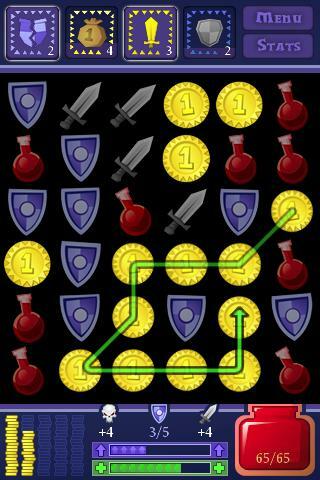 These games are characterized by selecting two adjacent tiles and swapping their positions. If three or more tiles of the same color are lined up orthogonally, then a match is created and the matched tiles are removed. If not, the tiles are immediately reverted to their previous positions. However, this is not always the case. Panel de Pon allows for tiles to be swapped without requiring a match, and the popular Puzzle & Dragons lets players touch a tile and slide it across the screen freely, functionally allowing for many swaps in a single swipe of a finger. Tile-tracing games are well-suited for touch devices. Tiles may touch in sets of three or more, but will not be removed without player action. To remove matching tiles in this genre, players must trace an uninterrupted line across tiles of the same color. Diagonals are usually accepted. Identifying matches in tile-tracing games is usually easier than in tile-swapping games, and setting up large future combos is emphasized. I hesitate to use the term “bubble” in a name meant to describe genre mechanics, but these games uniformly use bubbles, and I want these subgenre names to be intuitive. 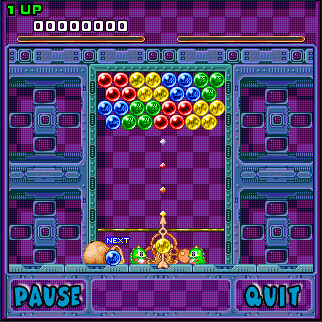 Bubble-matching games have a large field of bubbles in the upper part of the screen, and a player-controlled bubble launcher at the bottom. Gravity plays a large role in this genre; bubbles will stick to the ceiling and to other bubbles. A bubble that is not being held up by another will fall and be scored. They may touch in sets of three or more, but will not be removed without player action. The player may launch bubbles upward at different angles in order to bounce them off the side of the screen to reach bubbles they may not otherwise be able to reach. 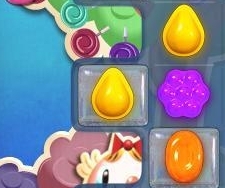 A unique feature to bubble matching games is that a player may misjudge an angle and launch a bubble to an unintended place, and this is an intended part of the challenge. 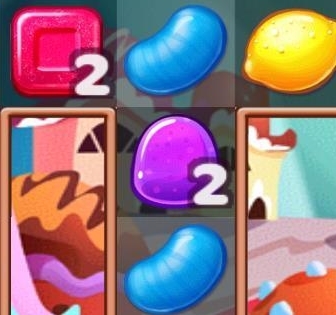 A major aspect of bubble-matching level design is to create opportunities for large drops, areas where a player may knock out the support for a large block of bubbles and clear a large area of the screen at once. 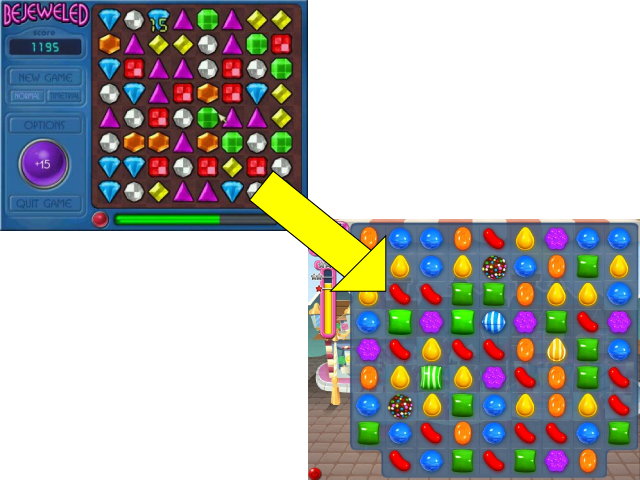 More than any of the other genres, bubble-matching games benefit from tall scrolling levels that a player cannot see all at once. These are games that meet the “Match three similar tiles” criteria that people don’t usually refer to as “Match-3”. These include Dr. Mario, Zuma, and Money Idol Exchanger. I’ll figure out names for these and cover them in more detail at a future point in time, but I just wanted to bring these up now to illustrate that the term is very broad, and tile-matching games are more diverse than people give them credit for. Back to puzzle games. Let’s talk about levels in puzzle design. For now, let’s ignore special objectives, special tiles, and that sort of thing. The number one most important tool in level design is the shape of the level itself. 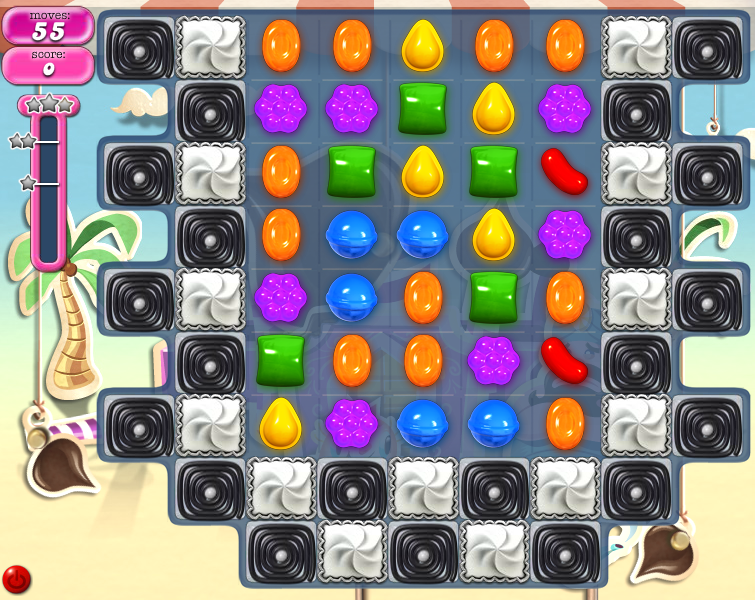 When I broke down level 65 of Candy Crush Saga, I mentioned that tiles on sides and corners are harder to match. I figured I’d zoom in on that specifically, since a level’s shape informs everything else placed in it. In a tile-swapping match-3 game, your basic verb is to swap tiles, and you can only swap tiles if they’ll make a horizontal or vertical match. Because this is your only verb, all objectives in tile-swapping games are based on matching tiles, whether your goal is to make specific types of matches or to make matches in particular areas of the board, which may become easier or harder depending on the board’s shape. On a micro level of design in this area, difficulty is controlled by how many usable spaces are adjacent to a tile. The space containing the dark blue tile is adjacent to four other spaces. I don’t think any official standard terminology exists, so I’m going to make my own and call it an open space. The dark blue tile can’t be matched with anything right now, but it’s certainly got a wide variety of options. It can be matched horizontally or vertically, to its left, its right, its top, or its bottom. It can be one of the edge pieces of a match, or it can be the middle. It has the widest flexibility for matching. Let’s remove one of those possible adjacent spaces and see what happens. Look at the spaces with the blue tiles in the center. I’m calling these walls, though depending on their orientation, they could be floors or ceilings. The first image is much less forgiving than the second, but they’re the same either way: They cannot be matched on their right side. This means that any horizontal match involving them must use them as an end piece and not a middle. For the sake of brevity, I’ll only list the traits of walls oriented to the right. The same principles apply no matter what direction the walls are facing. Cannot be middle of a horizontal match. Can be middle of vertical match. Can be end of horizontal match. Can be end of vertical match. The other is the hall. These can be vertical or horizontal. The purple piece and the lower blue piece in this image can be said to occupy hall spaces. Like the corner space, the hall space is disqualified from four of those traits listed. Finally, we have the nub, called so because they can only protrude from a larger mass by itself. These only have a single adjacent space, which severely limits their matching options. The central yellow space can only swap or be matched with whatever happens to be on its right. Matching nubs is especially difficult. Let’s break this one down too. This one looks really hard to match! You’d have to be very lucky or very skilled at exploiting opportunities to take it, but there’s one more kind of space you need to look out for! That’s right. There are games with tiles that have zero adjacent spaces next to them! Zero! I call these Solo Spaces! What can possibly be done about them? I’m not even going to bother running down the list for this one, because you can’t ever make matches with them or swap them. However, that doesn’t mean you can’t ever collect them! Many tile swapping puzzle games grant you the ability to create special tiles that can clear an entire row or column. If you see a level with a solo space, that means you need to make very careful use of your special tiles, because those are the only way you’re ever going to touch tiles on a solo space. The last time I talked about the modern Match-3 game, I said there was a lot more than just a shift to move limits. The biggest identifier of the modern Match-3 is that it has level design. 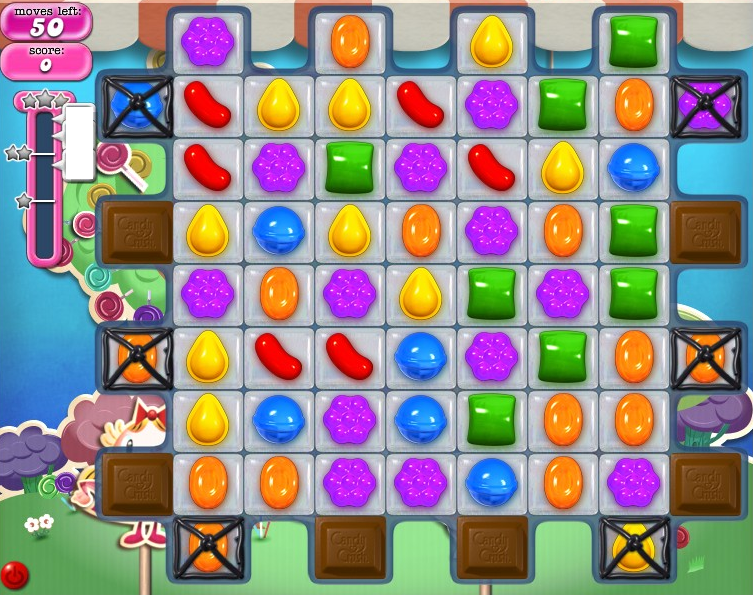 I’d like to demonstrate that by breaking down level 65 of Candy Crush Saga. 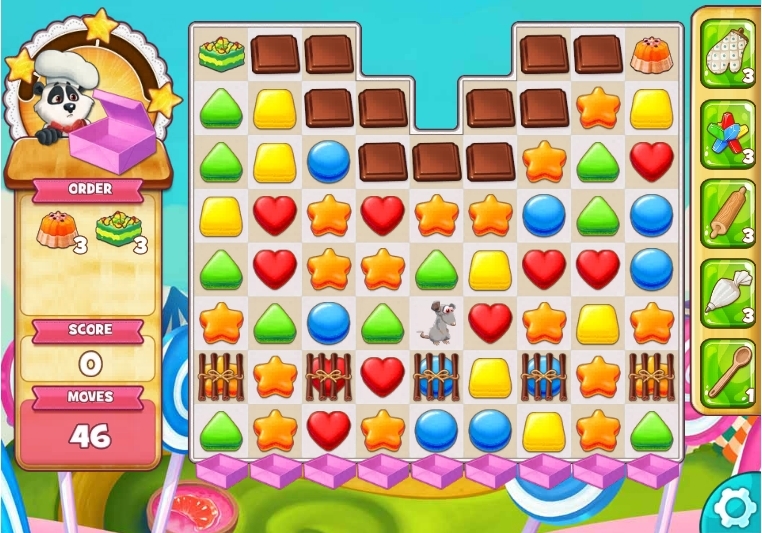 When Candy Crush Saga first launched, it had 65 levels. Level 65 was notoriously difficult, and it’s been altered to make it easier. I’d like to go over what made it so difficult, and how it was changed. This post is going to be a long one, so bear with me. I was playing Candy Crush on my phone on Saturday, and a friend asked what I was playing. I said it was Candy Crush, and I forget how the rest of the talk went, but they called it a Bejeweled clone, and that stuck with me. It reminded me of when people used to refer to first-person shooters as Doom clones, and how for a while, League of Legends was called a DotA clone. Match-3 games have come a long way since Bejeweled, but why are they still compared to Bejeweled specifically? The first thing that comes to mind is that for many people, Bejeweled was the first Match-3 that stuck with them. They haven’t really played Match-3 games since, and when they look at a modern one, they think back to Bejeweled. Of course, modern Match-3 games are vastly different beasts, although people don’t quite realize it yet. Bejeweled 2 (My baseline for this discussion) is based around making matches until you reach a target score, then you’re presented with a new level (keeping your special gems) and a new target score. This target score keeps rising (and so would your points per match). However, if you end up in a situation where no more matches are possible, the game ends. The longer you play in a level, the more likely, you’ll end up in a losing situation, so over time, you need to make more and more of your matches into higher-scoring ones and combos to get more points out of the time you have in a level. Most modern Match-3 games still have a score, but you no longer lose if you run out of possible matches. The board is just reshuffled. The loss condition is different: You’re given a certain number of moves to reach your goals (the old target score is now just a formality or omitted entirely). If you run out of moves, you lose. Why is that? You have limited moves instead of playing until you’re stuck for a few big reasons: The first is that the player has a clearer idea of how close they are to losing. Match-3 play is about identifying possible matches, and a fair amount of a player’s time is spent looking around for the possible matches they can make. They will clearly overlook some, and they know this, so if they make a match, they won’t know for sure that the end is coming. They might know it’s near, or it might catch them completely by surprise. “What? The game is over?” Giving the player a limited number of moves more clearly communicates to them the resources they have remaining and gives them a stronger feeling of control over the outcome. The moves system also gives the designer more control. Many new Match-3 games involve objectives other than scoring as high as they can. I’ll go into more detail on this in a future post, but the general idea is that Match-3 levels can vary widely in difficulty. A designer can create a level, do some testing, and conclude “This level takes, on average, 50 moves to beat.” They can give the players 50 moves, and then the player has an exciting experience where they’re running out of time, but victory is just within their grasp, and they make it with their final move. Or they might lose with just one move left to make (and consider spending money on buying just one more move so they can beat the level). This is just one way that modern Match-3 games are characterized. I’ll talk about this more later.